On my recent visit to Oxford, I found a hidden gem in the shopping mall. 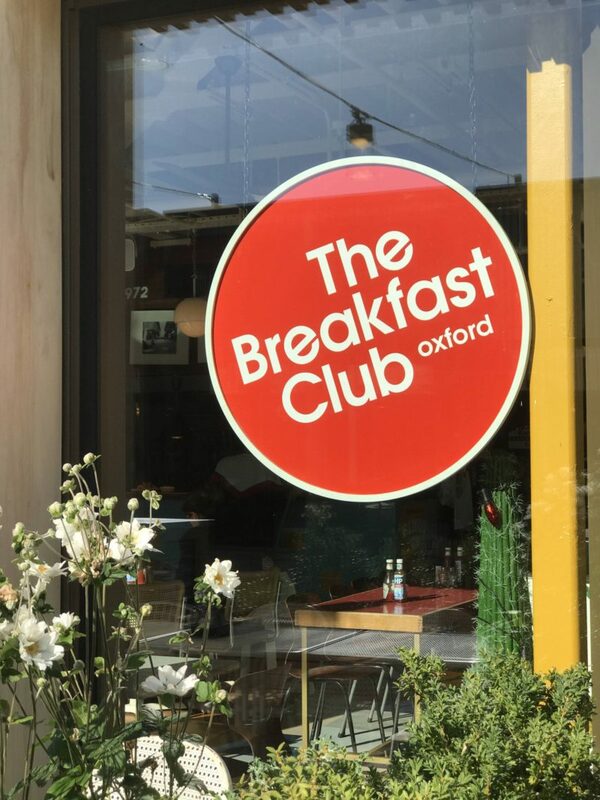 I’ve wanted to visit The Breakfast Club in London for FOREVER but every time I’m there, it’s just never happened. 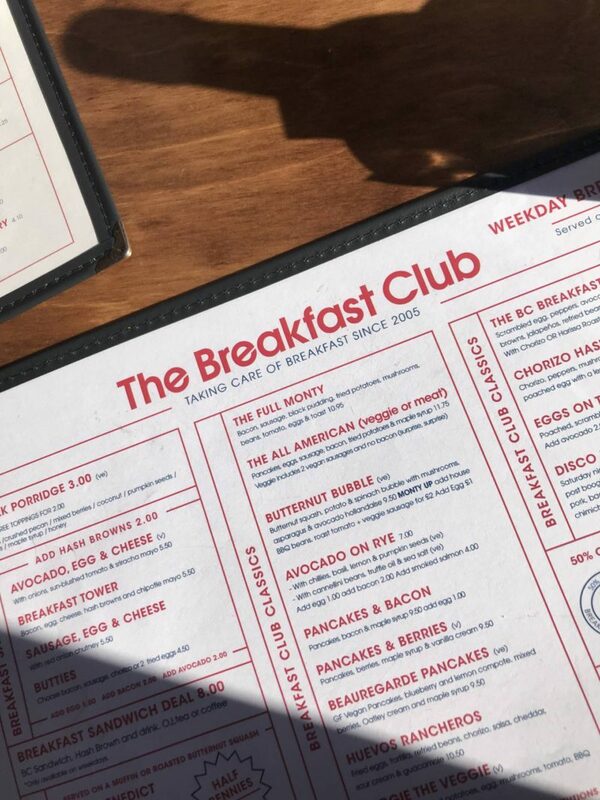 With retro vibes and an amazing breakfast menu, I couldn’t say no. 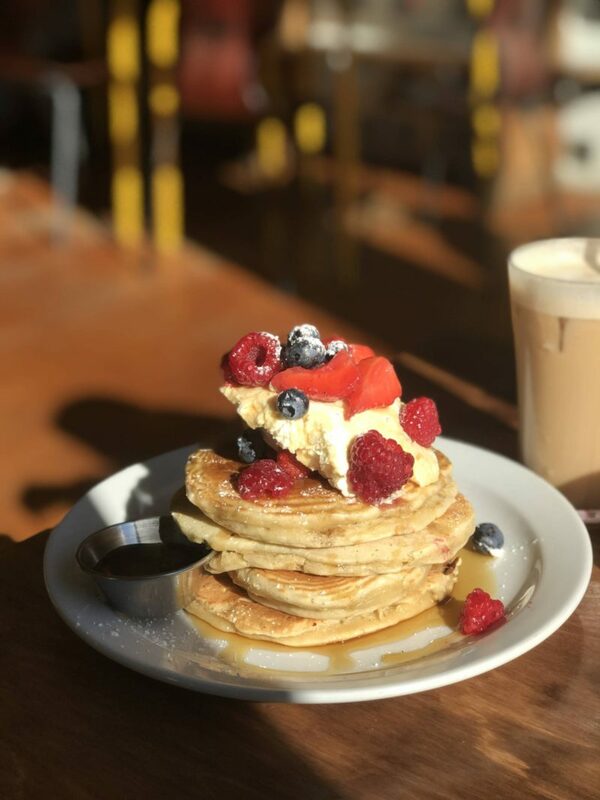 I seriously love all things brekky, and there’s a little cafe in Jesmond called 1901 that does breakfast ALL DAY (including waffles, eggs benedict and a full English) which I am often found at (I am actually there now as I type this) and I really wish there were more all-day breakfast options in the North East. We have a severe pancake shortage. 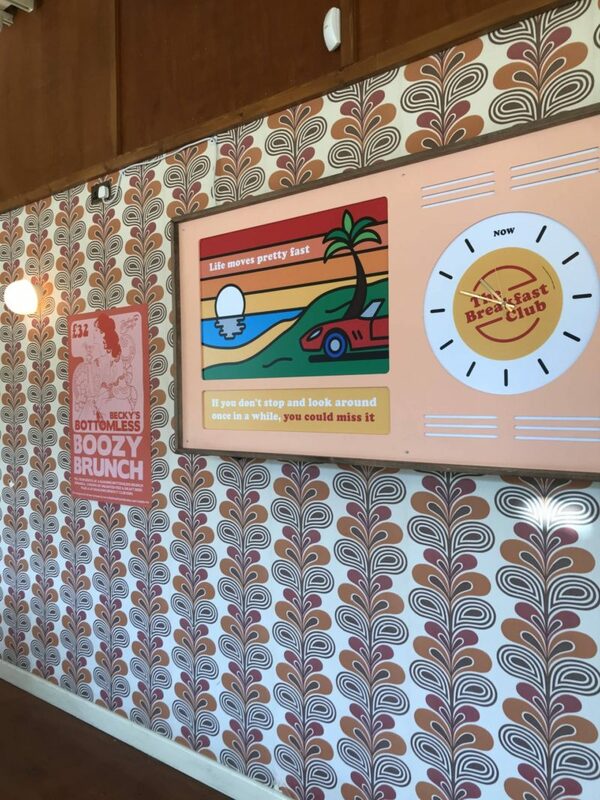 The interior is beautiful, incredibly 70’s inspired. 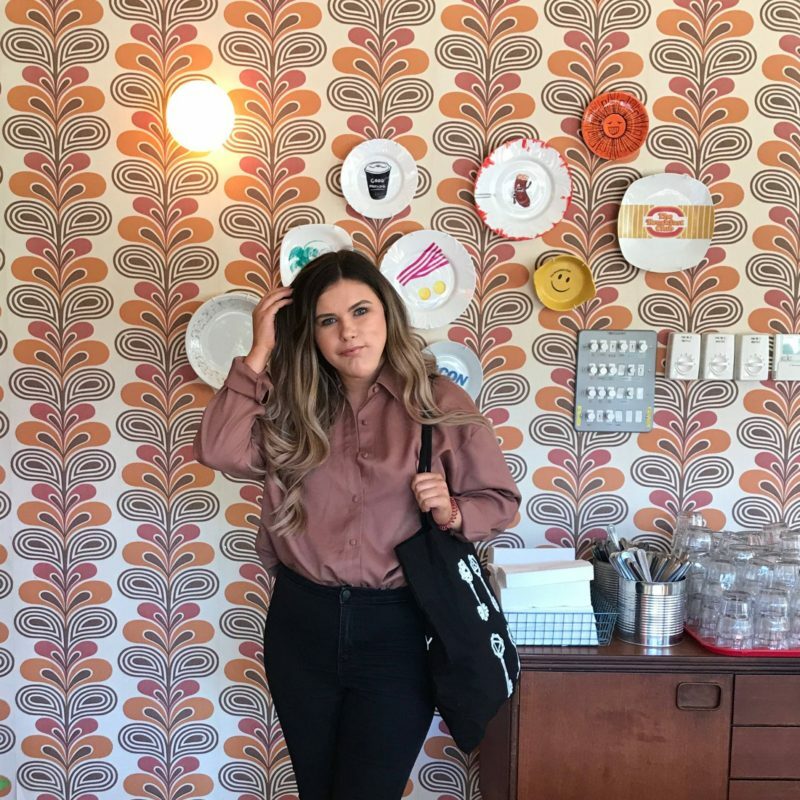 Lots of brown, throwback accessories and amazing decor. I mean, look at this wallpaper print. My favourite part of the decor is by far a Smeg fridge on the wall that when you open, leads to a secret bar room. I mean COME ON. Incredible. 5*. Can I have my birthday there? Whenever I go out for breakfast I’m always internally torn between sweet and savoury. I really wish places did a side of one pancake so I could still enjoy a full English with a little sweetness on the side. Even more so once I saw what my Dad ordered. He ordered the CABBIES BREAKFAST which is bacon, sausage, egg, chips, beans & toast, he guzzled it down before I could get a picture but you can see it sneakily in the back of one of the pictures. I don’t know how they made those chips, or if they’re magic potatoes but oh my god, they were incredible. Hands down the best chips I’ve ever had in my life. The picture makes me laugh, his hand creeping in to take a chip ruined my shot, you’d think he’d learn by now. I opted for the PANCAKES & BERRIES Pancakes, berries, maple syrup & vanilla cream. They were so light and fluffy, but I do wish you could order a half stack. I just want to say, these were absolutely HUGE. Incredibly massive and I barely made a dint but I loved them. The vanilla cream made them even moister (sorry) and the fresh fruit give them a nice tang. Washed down with a caramel iced latte, it was the breakfast of dreams. I really loved The Breakfast Club, we went on such a sunny day and even being attacked by wasps didn’t dull my experience, and I hate wasps. If you’re in the area, give it a go. If you’re not? Just dream about it. P.s, sorry the photos aren’t great, they’re all shot on an iPhone. I had no idea they had restaurants outside of London! I used to go quite a bit when I lived in London, I don’t know if it’s still as popular as when it first opened but back in the day you had to get up so so early to queue for a table. I think I was stood outside for an hour once, it made the queue outside Flat White Kitchen look tiny! 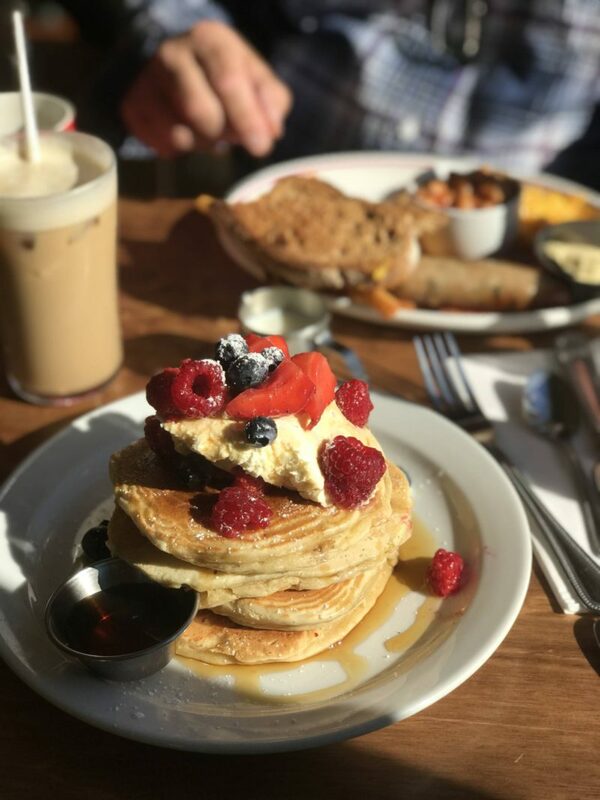 Those pancakes look amazing – sounds like a great breakfast spot!